Yum it’s grilling season! I love to grill everything…any way and every where! LOL How about you? 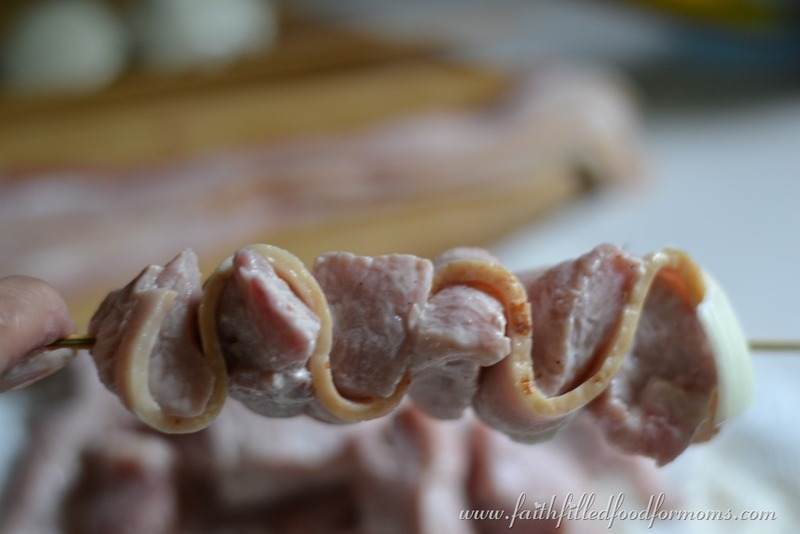 I just learned this little technique of threading Bacon in between meat. 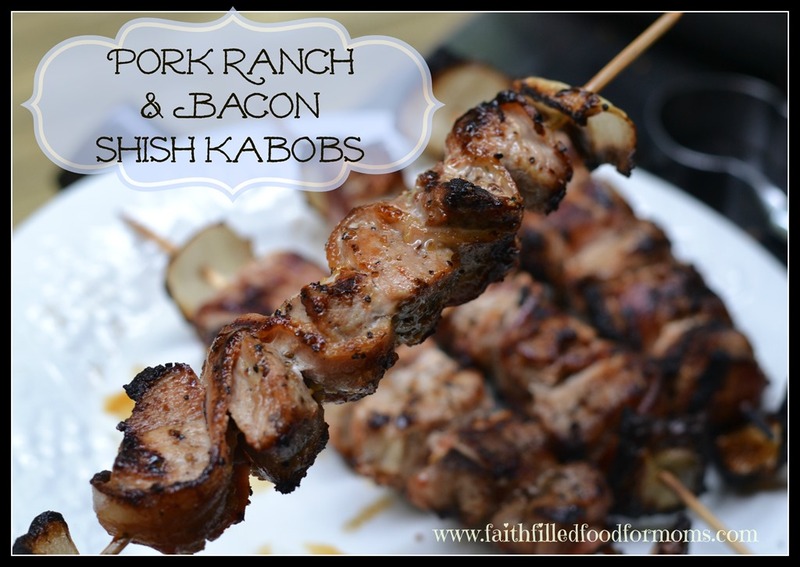 So I thought you all would enjoy this new recipe Grilled Pork Ranch and Bacon Shish Kabobs! Grilling is my absolute favorite! I also love to make these Grilled Potato Fries with Garlic Butter…YUM! If you like to try new and bold flavors and techniques, you may be interested in joining The Grill Masters! It’s a monthly subscription and you get lots of yummy spices! 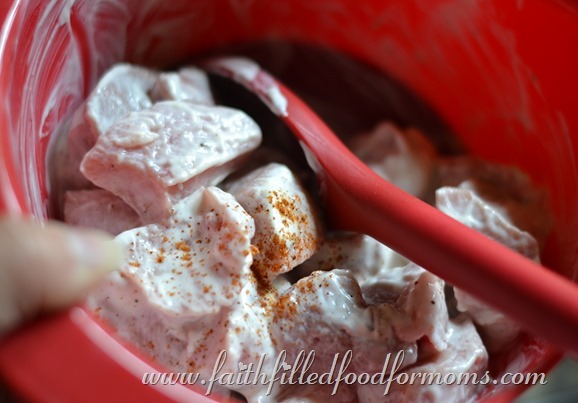 Cut up Pork into 1 inch cubes, put into a bowl and pour your Ranch Dressing in. Mix up and marinade for 1-3 hours Also while your meat marinades, be sure and soak your skewers in water if they are wood..this is so that they don’t catch on fire while grilling. 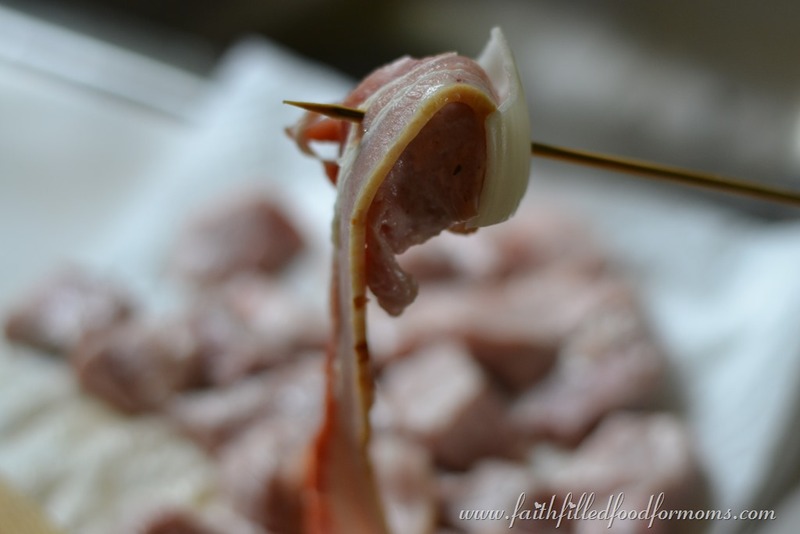 Now gather up the rest of your ingredients…Onion and Bacon…pat the excess Ranch off of the Pork with paper towels. 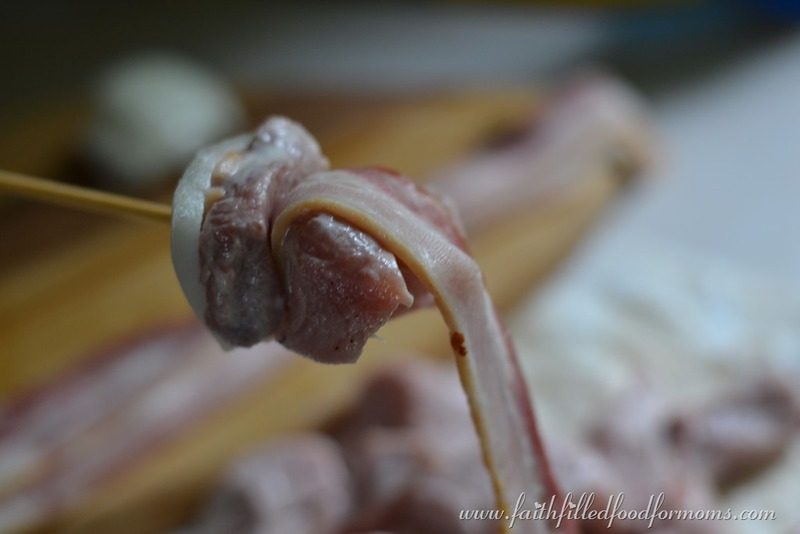 Cut onion so that you have some slices to put at each end of the Skewers. Now begin to thread onto Skewer! Put another piece of onion on the end. Then you can spread everything out just enough so that everything cooks evenly..
Now this is an awesome little trick I just learned….put foil under the Skewers so that they don’t get over heated and burn…then you can easily turn them! They do get hot but not too hot. Cook each side for about 3-4 min. and since there are 4 sides..that equals about 16 min. Inside meat temp should be 160 degrees if you want to check. These are deelish!! 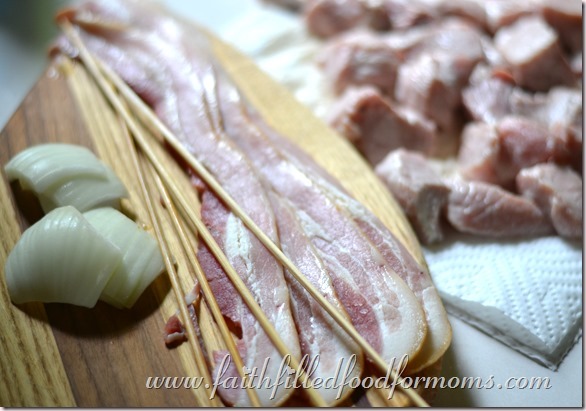 This can be made with any of your favorite meats! 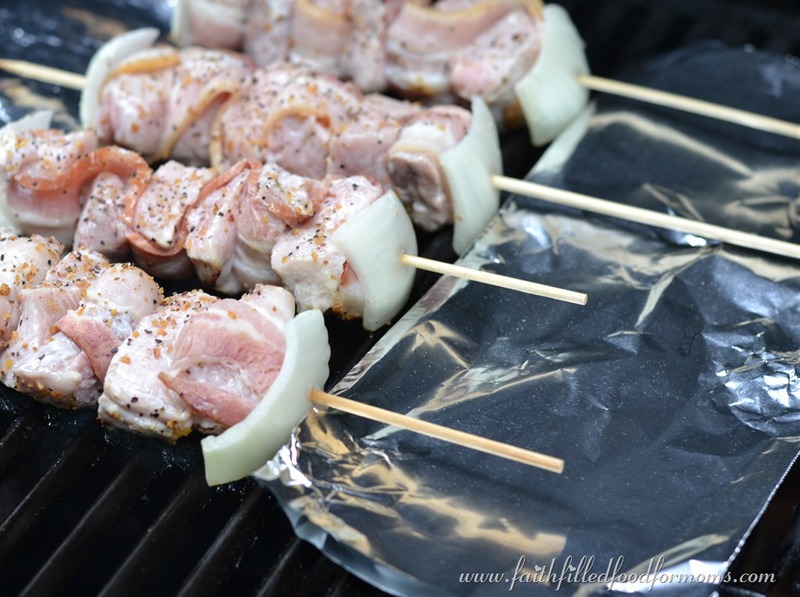 What kind of meat do you like to Grill and what kinds of Seasonings are your Fave? LOL and sooo easy! Thanks for stopping by!! Enjoy! Ok I have to try this! Your food always inspires me girl! I am stopping by from The Homemaking Party Blog Hop! Hi Susie! I’m glad it inspires! LOL I will stop over and say Hi for sure! 🙂 Blessings! Wow, Shari, this is made of awesome! 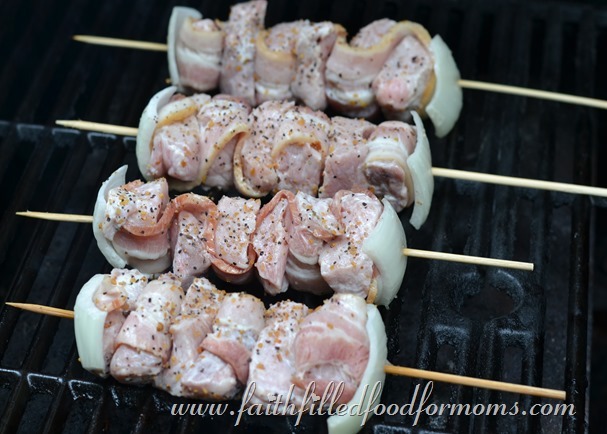 I really think my family would love this so I am saving it for some summertime fun! Oh this looks good. I seldom cook pork, but this looks like something my family would like. 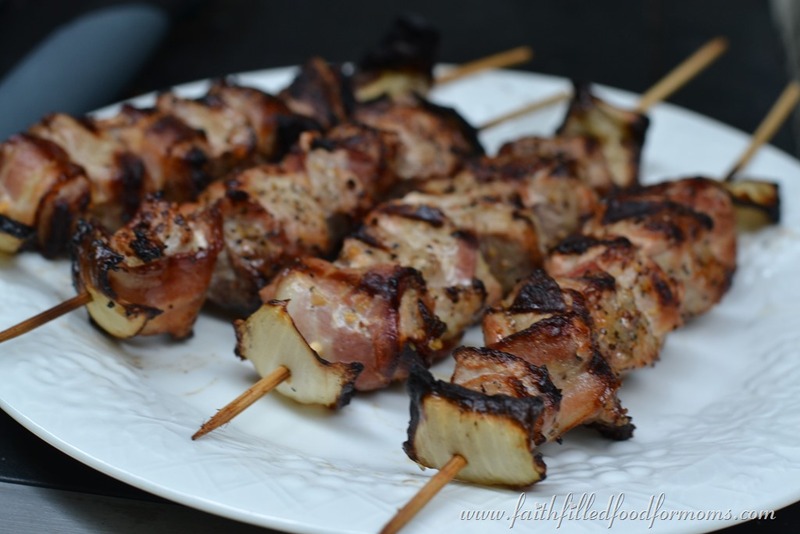 And kabobs are always so fun! Thanks for sharing this, dear! Yum! Doesn’t bacon just make everything taste better? Thanks for linking up to our Twirl and Take a Bow Party! Hope to see you again next week! Brilliant! Love how to threaded the kabobs! My hubby would just love these. I will have to surprise him.